The following series of blog posts are going to be somewhat real and authentic, spontaneous commentaries on the Gospel of John. I’m not into being impressive, so don’t expect some kind of eloquent exegesis of this Gospel, you’ve got books for that. This is going to be real, hopefully inspiring, and maybe even tough to hear commentary on the 21 chapters of John. So get locked and loaded and let’s make this a group event. Today begins John Chapter 1, feel free to comment on what is said or what the chapter says and we’ll have us a good ol’ time having conversation about the passage. John 1 <—- Click here for link to passage. We read in the beginning of this wonderful gospel a beautiful broad description of Christ’s arrival into the dark world. He is the light of the world, and the darkness did not comprehend it, other translations say things like “didn’t understand it”, and even others say things like “the darkness could not overcome it”. Then this passage speaks of John the baptist, a kinda crude unkept wild eyed dude, who came out of the wilderness talking about the messiah, the baptism, and preaching repentance for the Kingdom of God is here. This chapter also include the early movement of Jesus’ followers who had the eyes to see Jesus and to follow Him. The thing that stands out to me about this passage that I think we could use to hear today is that Jesus was the hair in the biscuit. Before Christ arrived on the scene there was no force or person powerful enough to truly divide the light from the dark. In essence, there was only darkness and dimly seen perspectives of what was good and right. So Jesus stepped on the scene causing some serious division. In other New Testament passages it is written that Jesus “did not come to bring peace, but a sword (Matt 10:34).” This is the Jesus we are living with, and we can’t pretend it away. Jesus shined so very brightly that people had to make a decision to follow Him or to reject Him. This is what we too are called to, as we have accepted Him we now are called to live for Him and with Him. Now we too are the light of the world. We too are the hair in the biscuit. We have been called to stand with this Jesus in the secret places of our hearts and our time, so that we can stand confidently and comfortably with Him in public. 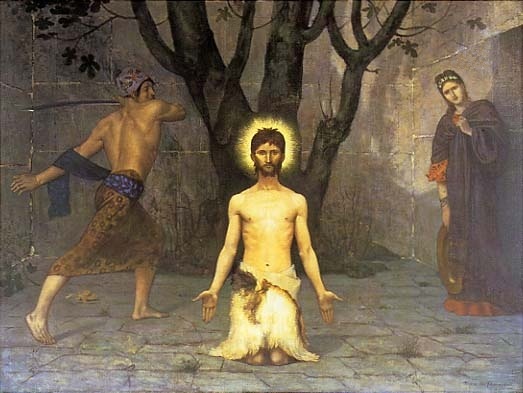 John the baptist stayed in the wilderness because the religious world was so corrupt that he needed to separate himself to keep his fire burning. What about you? Can you see the difference between the dark and light? Are you running toward truth and love with enough fervor that you are becoming more illuminated? It’s the light that develops inside of us that gives us right morality and right actions. We don’t have to make a spectacle of ourselves trying to be light. We simply turn with the secret parts of our lives; reading scripture, praying often, confessing sins, praying for others, giving freely, loving others. Then we too will become light and have the courage to know God’s heart and even be willing to be rejected like Jesus, John the Baptist, the disciples, and countless others. The light has come shining brightly, making evil and heartaches flee. Find comfort in His light today, for every other comfort is false. You were made to dwell in the light. Thanks B! That means a lot to me. I’ll be praying for you as we continue to study together. Sounds pretty interesting to me too Jason! Count me and Fred in! Thanks for doing this!